Faces Lipstick Satin Matte is enhanced with vitamin E and raw mango extract to help skin repair in opposition to climatic change and also to guard and dampen with every beautifying application. 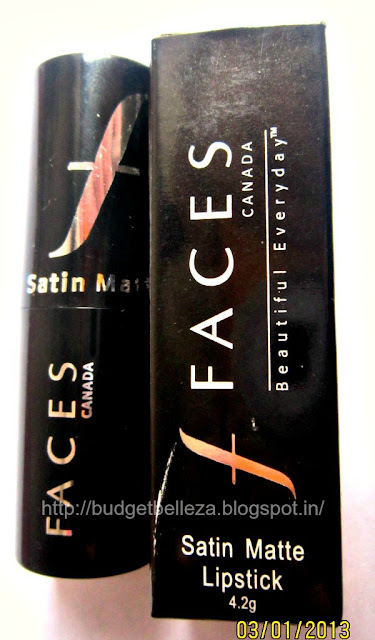 Faces Lipstick Satin Matte offers uniform lip colour coverage and is free from perfume and lanolin. It is very moisturizing and does not dry out. 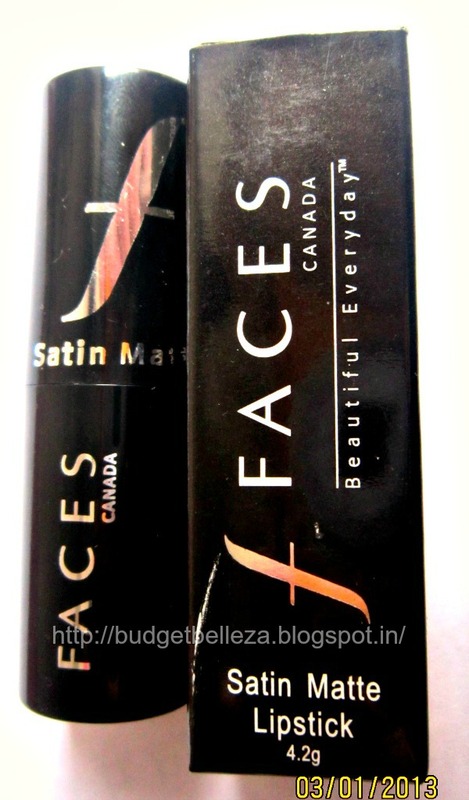 Faces Lipstick Satin Matte has shades to boost up your lips. It offers a semi matte finish to your lips and is highly pigmented so a single swipe is more than enough to offer an intense colour to your lips. Cafe'Latte Brown is a caramel brown kinda shade. It has no specific undertones. 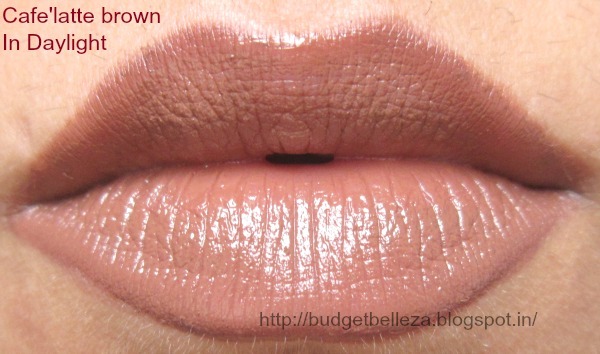 Though it looks pretty deep on my hand swatch,it comes out much lighter kinda mlbb on my lips. The shade is subtle and can be worn everyday..a boon for office goers! Would suit all skin tones,specially the duskier beauties! 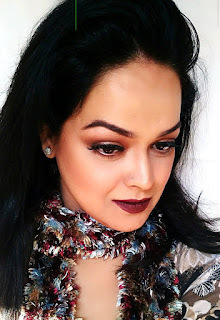 The texture of the lipstick is super creamy.It glides on the lips like a dream. 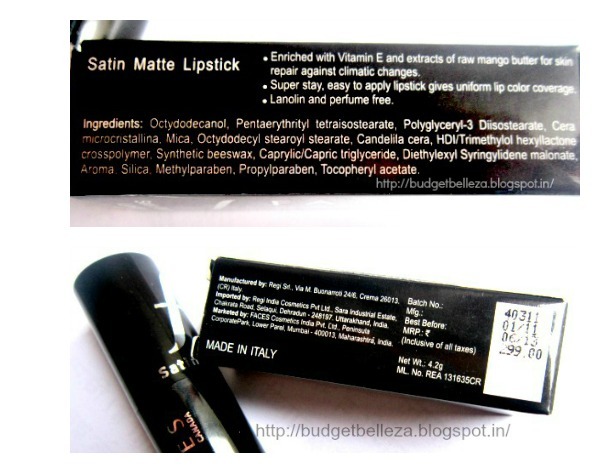 Infact unlike its name its more satin than matte. My dry lips do not require a balm underneath. This is my first buy from the Faces Satin Matte range and I love how pigmented and moisturising these lipsticks are. The colour is buildable though it gives an opaque finish in a single swipe. 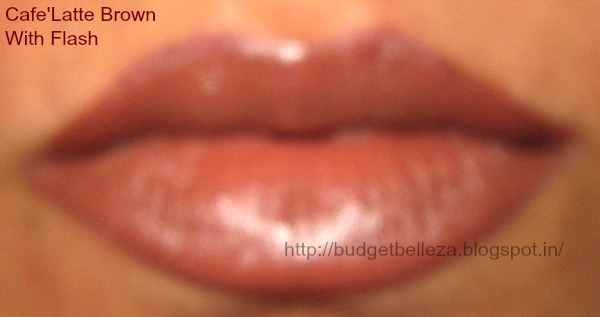 The shade though caramel brown on lighter skin can prove to be very natural mlbb shade on deeper warmer skin tones. Because the shade doesn't have any specific undertones,it did not brighten up my face noticeably but still its the kind of shade one would reach out for often as it goes well with whatever one's wearing. I generally prefer my lipsticks to be fragrance-free,but this one has a very yummy coconut-caramel fragrance to it which isn't at all overpowering. It also has a good staying power considering its so moisturising.It stayed on me for 3-4 hours and I don't even expect more than this from such a creamy lipstick. 4. Doesn't accentuate fine lines. 5. Staying power is more than average for this texture. 2. Its so creamy..yet to see how its gonna face the north Indian summers. 3. Has parabens in the ingredient list. I really liked the formula.This particular shade would suit everyone and the duskier beauties would love it to bits. Definitely..but some other shade from this range!